Some folks out there are just more passionate about what they do than the average person. They radiate a passion for their work that shines through everything they do. One of those people is Boris Stolle, who has been part of the eyewear business since 1999 and out on the frontlines every single day as a road rep since 2007. 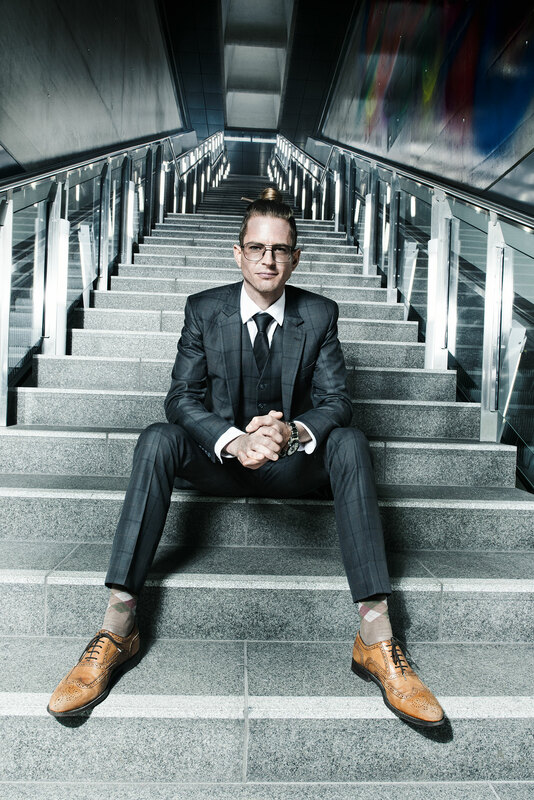 Through it all, the native of Cologne, Germany, has retained his youthful enthusiasm – probably because he loves what he sells – and is committed to offering opticians the best products and sales tools available. In our Industry Insights segment, the seasoned vet shares some secrets of the trade. Boris, what brought you into eyewear, initially? Either fate or pure chance. At age 17 I had no clue what I was doing, so I applied at an optical store. They hired me and that was the starting point. What made you decide to make the switch and become a road rep ten years ago? I had always been fascinated by the reps that came through our store. They were always in a chipper mood, always had some exciting stories, and they traveled all the time. I was mulling it over for a long time before things fell into place rather quickly around the end of 2006. Which labels were in your portfolio at the outset? A good friend connected me to Wolfgang Proksch, ByWP and Martin&Martin. The rest happened almost instantly: Three phone calls, job interviews, quick trial period – and I was fully onboard. All involved gave me amazing support. Next it was all about knocking on a lot of doors and building a contact network. Logging a lot of miles and getting a feel for the market. You know, I was making a huge switch from an optical store in a rural area into the great wide world of eyewear. Aside from those collections mentioned above, I also had a quick peek into the price-driven category. But I quickly realized that’s not my cup of tea. So you made a conscious commitment to indy labels? Yes, I couldn’t really imagine selling anything else. I’m personally a big admirer of quality in all walks of life. And whenever there’s a fascinating story behind a great product and not some big corporation, it just adds so much value. For me it really improves the overall quality of life. You are also engaging with a receptive client base when you’re selling independent labels. Up until last year, I was moonlighting at an optical store where I would always point customers towards the premium product segment. That was the most fun – for myself and the customers. Really, you had a side-gig working for an optician? Yes, mostly for fun, but also not to lose touch with opticians’ needs and wants. And my experiences with end consumers are really paying off in my current work. I’ve always tremendously enjoyed the job. Choosing the right glasses together with the customer is just the best. After all, we are selling an emotion and a way of life, and the better we do our job, the more grateful the customers will be when they get complimented on their glasses that also offer them a perfect vision. That also creates trust in a relationship, which was always important to me. But right now you can’t be found behind the counter, right? No, right now I don’t really have the time. I’m currently out on the road with the KBL and Lunor collections in [German] postal codes starting with a 4 and 5, so it’s not getting boring anytime soon. Do these collections fit together? By all means. Actually, my trunk is too small for both collections but the combination is unbeatable. Both collections don’t clash in terms of design but speak to the same kind of optician. Of course I’m always trying to keep an eye on the bigger picture. I’m still young and still have a lot ahead of me, and there’s a lot of work to be done. Generally, you should always stay on the ball and keep up to date on the latest developments. Our industry is constantly evolving and we should be doing the same. You’re a pretty energetic individual. Does that come from a certain work ethic? I want to offer my customers more than a good product, but also outstanding service and my entire expertise. I really don’t see myself as a salesman, but more as a consultant or good friend. Just doing the sales spiel is not my thing. I’m more interested in building an ongoing relationship with my clients. They can always count on me, but I know I can also count on them – it’s a cooperation at eye level. That philosophy is the foundation on which I’m building my network and makes it the most fun for everyone. I’ve actually build great friendships with some of my clients, which I really appreciate as an extra perk. Which opticians do you find impressive? The ones just doing their own thing and really living their job. The ones who stand out from the pack and stay informed on the latest developments and never stop learning. Those who put their passion and individuality into their work every single day – that’s a solid foundation for long-term success. Customers can sense in an instant whether someone loves what they do or not. And passion for your job is a great business card, as word tends to get around. Looking ahead, what are the challenges for opticians to stand their ground in the market? That’s a complex question. I have my own personal perspective on it: I say, let’s leave mass-products and “just selling” to others. What counts for premium opticians is service, good customer consultation, no fear of high prices and a clear market position. And in face of the many competitors in the growing online business, it’s essential that opticians communicate to customers what it means to buy their glasses from them. And why things cost as much as they do. The operative word is transparency. There will always be folks selling for cheap online or offline. But every optician needs to make the personal decision of what works best for them. But I’m also clearly convinced that the way people purchase eyewear is not going to change anytime soon. End customers have become increasingly sensitive and fortunately, many of them appreciate the services of a quality optician and are ready to invest more into quality. You are always out there in a smart-looking suit, which is rather outside the norm nowadays. Hey thanks for the compliment, but what really is the “norm” today? Tattoos, beards, rimless or acetate? The way I see it, anything goes. It just has to be a good fit and make you feel comfortable. The whole suit thing happened a few years ago for no apparent reason. And somehow, it stuck. People should have become used to that at this point. It happened much like the suit. I really wanted a top knot at some point and just started growing my hair out. That was three years ago – and there’s no end in sight.